Bona Vista Selfcatering Accommodation - Klapmuts Accommodation. 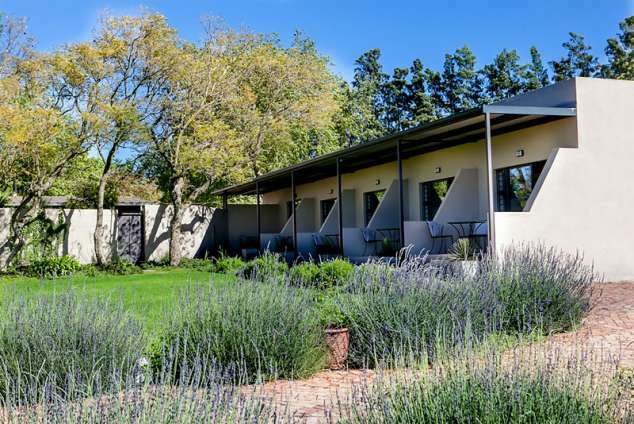 Bona Vista offers 5 stylish and modern selfcatering, en-suite rooms within a farm environment, just 10 km from Paarl and 15km from Stellenbosch. The rooms are Twin/King bedded with a private covered patio area. Each room has a Shower/toilet en suite. Rooms are equipped with aircons, Dstv(hotel package), free WiFi and hairdryers. The kitchenette area contains a electric frying pan, fridge, microwave, wash-up basin, kettle, toaster, crockery and cutlery. Braai facilities are available. The historic town of Paarl offers many activities. Visit the KWV for a cellar tour or stroll around the Afrikaans Language Monument. Enjoy a visit to the nearby Butterfly World, Lion Park or Crocodile farm. The area offers good restaurants and many winetasting opportunities. It is a restful environment and can be enjoyed by people wanting a quiet time. For evening dining out, there are plentiful award winning restaurants in Paarl and Stellenbosch. The area offers good restaurants and many winetasting opportunities..It is a restful environment and can be enjoyed by people wanting a quiet time. For evening dining out, there are plentiful award winning restaurants in Paarl and Stellenbosch. The Victoria & Alfred Waterfront and Table Mountain is only a 45km drive. 8881 page views since 06 Sep, 2013.